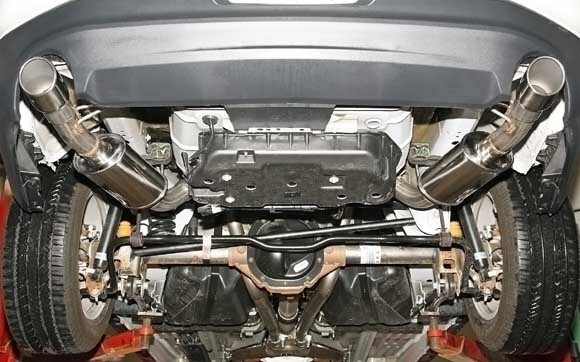 It i’s no secret one of the first modifications nearly every Ford Mustang owner completes is exhaust work–be it a cat-back, axle-back, hi-flowing mid pipe, headers, or the sort. Hey, Ford–not that you did a bad job with the factory tailpipe melodies produced, it’s just there are just SO many awesome combinations of acoustic awesomeness out there on the aftermarket, and people LOVE to have their Mustang stand out from the masses. Fresh up this week from the folks at MRT is a fantastic new exhaust system for the 2011 Ford Mustang and the 2012 Ford Mustang. The MRT Interceptor Axle Back Exhaust System was, like the rest so dubbed, designed in-house & produced in the USA, achieving a quality product that’s a total point of pride. These Mustang exhaust systems feature 304 stainless tubing, are mandrel-bent for maximum flow, and are capped off with 304 stainless steel mufflers, ensuring this system will last for years to come. Plymouth, Michigan- Responding to the demand of 2011-2012 Mustang GT owners for a more performance exhaust sound, MRT has developed their new 2011-2012 Mustang GT Interceptor Axle Back Exhaust Series. Like all MRT exhaust systems, the 2011-2012 Interceptor Series is designed, engineered and manufactured in the company’s state of the art facility in Plymouth, Michigan. Engineered for top notch results, the Interceptor Series optimizes exhaust flow for maximum performance, while producing the deep, throaty, muscle car sound that Mustang owners prefer. The MRT Interceptor axle-back system for the 2011-2012 Mustang GT features 304 stainless steel construction and CNC mandrel-bent tubing for maximum durability and fit. Both the mufflers and tubing are 304 stainless steel for trouble free performance. The Interceptor Series system features a new muffler that is designed to give off less annoying resonance and a much better sound quality exhaust note. The Interceptor systems come with 4” stainless steel tips. As with all MRT exhaust products, the 2011-2012 Mustang GT systems clamp on directly in place of the factory axle-back system for easy installation with no drilling required. MRT, headquartered in Plymouth, Michigan is a performance aftermarket engineering, customization and sales company that specializes in automotive exhaust, styling and performance.